Minister of Tourism & Economic Affairs Mellissa Arrindell-Doncher on Wednesday congratulated St. Maarten’s “super culinary team” that recently competed in the Taste of the Caribbean showcase. “We are so very proud of our team of chefs, bartenders, pastry specialists for their tremendous showing at Taste of the Caribbean. They reminded the world once again that St. Maarten is a culinary destination matched by few,” the Minister said. “They work very hard at what they do and let’s not forget they do it on a daily basis here at home at their specific places of employment or independently. Special mention has to be made of NIPA student Suzie Adoptie who has a very bright future. She forms part of our super culinary team who did extremely well,” the Minister added. The Minister also thanked the St. Maarten Tourist Bureau, its Director and hard-working staff for being present at the event to support the team. Thanks were also extended to the members of the St. Maarten Hospitality & Trade Association for their support of the team and the event. Taste of the Caribbean is the region’s premier culinary competition and cultural showcase. Since 1993, the best chefs and culinary teams unite to learn, demonstrate their skills and provide a scintillating exhibition of the most savory and delectable treats of the islands. Produced by the Caribbean Hotel and Tourism Association (CHTA), Taste of the Caribbean provides a forum for gathering practical information, developing skills, sampling, purchasing, strengthening and establishing supplier relationships and meeting new vendors. 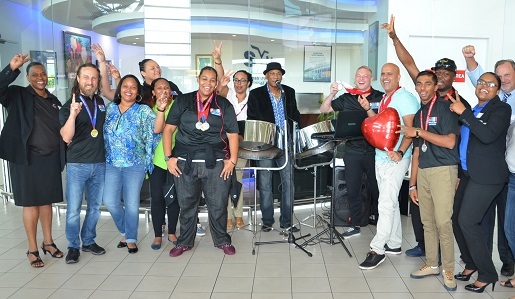 Caption: St. Maarten’s culinary team arrived home on Wednesday afternoon and was met by family, supporters, members of the SHTA and staff of the St. Maarten Tourist Bureau.